The apartment for 4 people (big apartment) is equipped with a living room, a kitchenette with all accessories (kitchen with 4 burners, electric oven and sink), double bedroom and bathroom with shower, sink, bidet and toilet. The 2 single beds are located in an area inside the big living room. Also there is a free wifi internet access and satellite TV. Maximum 4 people can be accommodated. The apartment is on the first floor and is accessible via an external staircase. 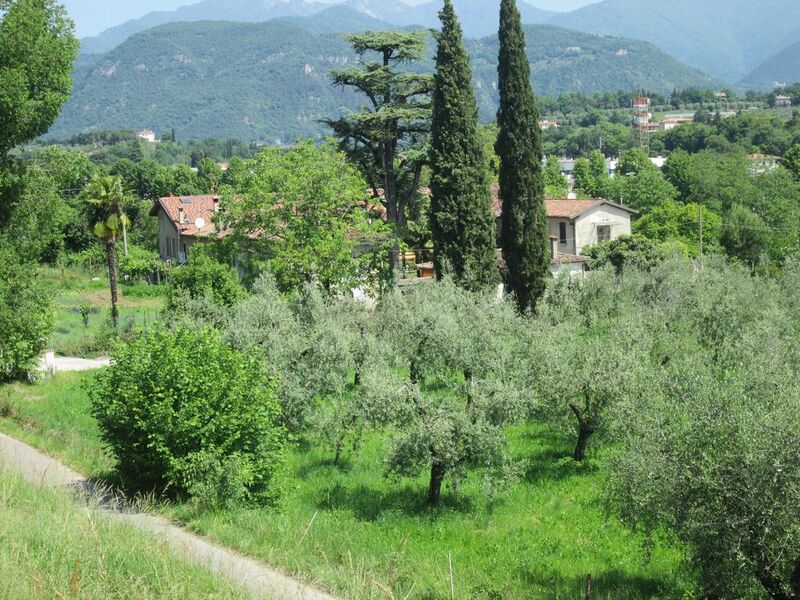 The company, which produces and sells extra-virgin olive oil, is located in the countryside of Cunettone, a hamlet of Salò, on the border with Puegnago del Garda. Welcomes its guests in comfortable apartments with Wi-Fi and satellite TV, located on the first floor of a hotel surrounded by a beautiful garden with tables and barbecue, ideal for relaxation and outdoor grilling. The apartment for 2 persons (unit 4145063) has a living room, a dining room with fridge, equipped kitchenette (4 burners, electric oven and sink), a double bedroom and a bathroom with shower, sink, bidet and WC. Baggage can be stored in the attic of relevance. The apartment for 4 persons (unit 1655383) The apartment for 4 persons has a living room, equipped kitchenette (4 burners, electric oven and sink), fridge, double bedroom and bathroom with shower, sink, bidet and WC. The 2 single beds are located in a reserved area inside the large living room. At the disposal of all, a parking space inside a courtyard. Both apartments are on the first floor and accessible via an external staircase. Near the farm there are supermarkets, bars, pubs, restaurants and a bike rental, all within walking distance. 2 km away are the small lakes of Sovenigo, where you can fish; a cycle path unravels in the Valtenesi countryside. The nearest beaches (Salò, Gardiola, Baia del Vento, Pieve di Manerba) are 5 km away. There are numerous art cities that can be reached by car: Brescia at 30 km, Verona and Mantova at 50 km; Milan at 120 km. Venice is 2 hours away by train (from the Desenzano del Garda Station). We really enjoyed our time. It was a nice, calm and cosy apartment. As a young family we relaxed a lot. The appartment was clean, a kitchen with all stuff you Need. The surrounding was really beautiful, and we loved the typical Italian Atmosphere. The Owner Gabriele was really gentle and always helpful!!! We highly recommend the accommodation!!! And you have to try the selfmade Olive oil!!!! Its a Must! Wir (2 Erwachsene + 15-jähriger Sohn + Hund) haben 10 entspannte Tage in der großen Wohnung verbracht. Gabriele ist ein sehr netter und aufmerksamer Gastgeber. Die Wohnung ist mit allem, was man braucht ausgestattet. Der verwunschene Garten lädt zum Vermeilen ein. Mit dem Auto hat man schnell den See erreicht (z.B. Porto Portese mit dem schönen Hundestrand oder Salò). magnifique village de salo a10mns en voiture. le proprietaire est tres serviable et bienveillant. nous y avons passes une tres bonne semaine. Proprietari gentilissimi ci hanno accolto con molto garbo offrendoci anche delle loro verdure di stagione molto buone ..noi siamo arrivati con 2 cani che si sono adattati immediatamente. Abbiamo assaggiato l' olio di loro produzione Buonissimo . La cascina si trova a pochi passi da Salò e Manerba, immersa nel silenzio. Penso proprio che il prossimo anno ritornerò da loro sperando di poter trascorrere almeno 2 settimane di ferie. La ferme est idéalement située pour visiter le sud et l'ouest du lac de Garde mais à 300 m de la route nationale, très passante : il ne faut pas s'imaginer le calme de la campagne mais c'est très supportable, même dans le jardin, agréable et bien équipé. L' appartement pour 2 en étage est confortable (merci pour les moustiquaires, très nécessaires, et la WIFI) : tenu fermé la journée il n'était pas trop chaud. Et puis l'accueil du père de Gabriele a été super : il nous a offert plusieurs fois des fruits et légumes de sa production ! / Idealmente posta per visitare l'est e l'ovest del lago, la casa si trova a 300m della strada satatale, piutosto frequentata , ma anche dal giardino, ben atrezzato e piacevole, il rumore del traffico non reca disturbo. L' appartamento , al 1°piano, per 2 persone é comodo (Grazie per le zanzariere , essenziali, e la wifi). Con finestre e persiane chiuse in giornata l'appartamento resta fresco. Bene Accolti dal padre di Gabriele, ci é stato afferto al nostro arrivo, e più volte nella settimana, frutta e verdura di loro produzione. The property falls within the Parco Alto Garda Bresciano and Valtenesi. In Alto Garda Park (from Salo Tremosine) there are several hiking trails. In the direction of Desenzano del Garda, in the area of ​​Valtenesi, you can visit the small villages, castles and historic churches. The nearest golf course (Colombaro Golf Club, 9 holes) can be reached on foot, while the golf courses with 27 holes (Golf Club Arzaga, Garda Golf) are within a 15-20 minute drive.